For over 25 years, The New School has been an innovative and student-centered voice in education. It’s not easy to sum up a school as unique as ours. Perhaps the best word to describe The New School is thoughtful. Students feel intellectually excited and challenged, and appreciated as individuals by their teachers and peers. NSNVA knows that such a culture of thoughtfulness – of the mind and heart – brings out the best in teachers and students and makes for a rich and wholesome school environment, thus creating an ideal foundation for learning. NSNVA approached 80Port for a complete overhaul of their digital presence. The 80Port web design team went to work development and refining requirements to best meet the unique needs of the NSNVA redesign. The redesign included an intuitive, easy-to-use interface that allows students, staff, parents, visitors, and partners to complete their tasks and locate information quickly and easily regardless of the device they are using. Responsive design, including mobile-device compatible interfaces make navigating the site easy and intuitive. Our development team integrated Web forms for various departments to process information and drive enrolment. 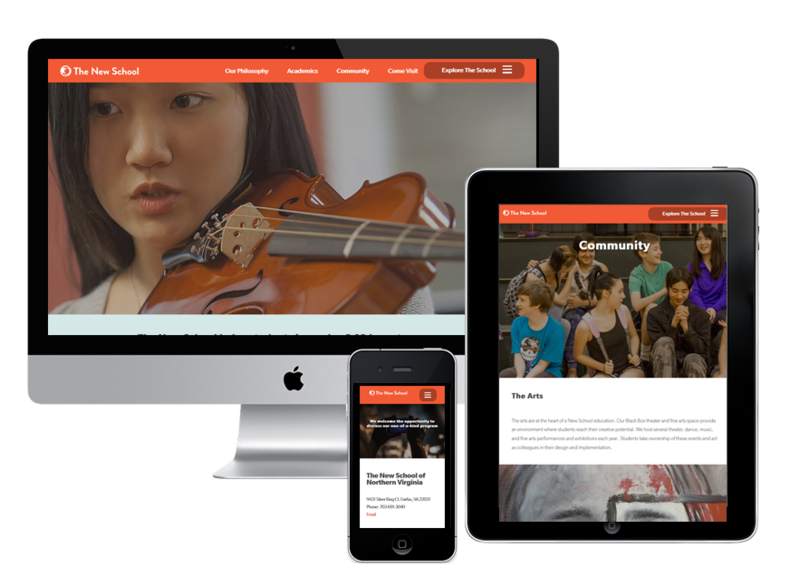 With their brand new responsive website, NSNVA is positioned to become one of the region’s leaders in education. NSNVA - 80Port web design agency in DC is a full service marketing and digital design agency specializing in the development of fresh digital media design. We build brands, experiences and campaigns for every screen. We partner with DC businesses to help them achieve measurable results. Our offices are located in DC, our proximity allowing us to work closely with our DC business partners.